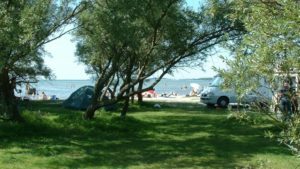 Lomma camping & resort offers a wonderful child friendly beach and a long pier for swimming and fun games. 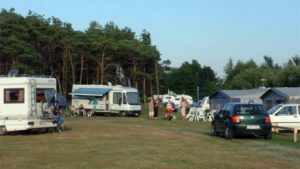 The campsite offers also a playground, soccerfield, boule, a kiosk and mini golf. Large green areas perfect for fun and games, for both young and old. If you instead want to explore the surrounding areas there are many possibilities. Great restaurants in "Lomma Strandstad"
Only a short beachwalk away you will find the newly built "Lomma Strandstad" with beach and yachting, marina, shops and lovely restaurants. Four hundred meters offshore you will find Bjärreds Kallbadhus which offers sauna, swimming and a breathtaking view over the sea, Turning Torso, Copenhagen and the Øresund Bridge. The restaurant is open daytime and evening hours. The surrounding area offers a variety of fishing opportunities for all tastes. Calm ponds, running water and deep sea fishing . Are you looking for hiking areas? Then you have Habo Ljung Fure "next door" to the campsite. Outdoor life in the area is extensive and Lomma offers a great variety in nature. The beautiful beach in Habo Ljung makes it a a popular spot for kite- and wind surfers. Watch or try this action-packed sport. Do you want to learn how to kitesurf? Contact Kitelife a certified kitesurfing school located on Lomma camping & resort. Want to play some golf? A few hundred meters away, you will find Örestads golf club. Pro or a happy amateur? No, problem. The golf course suites both categories. Restaurant in the clubhouse. For a vibrant city life with shopping, nightlife, museums and exhibitions, it is not far. By car you can reach Malmö, Lund, and the Öresund Bridge in 10-20 minutes. Good bus connections from Lomma Center. Visit Borgeby and feel the history. The castle has its origin from the 900s and holds much history of Skåne. Well worth a visit. Besides Lomma camping & resorts own range, offers Lomma good restaurants within walking distance. Culinary taste sensations, marine lunches, Mediterranean cuisine, fish specialties, or why not a delicious bakery?